Today’s post is very special. I present to you a Q&A session with artist, Kristina Estell. Estell is an artist living and working in Minnesota. I first worked with Estell when I invited her to exhibit her work for a solo show, “Generalizing From Rare Examples,” at the University of South Dakota. Below are photographs from that installation. 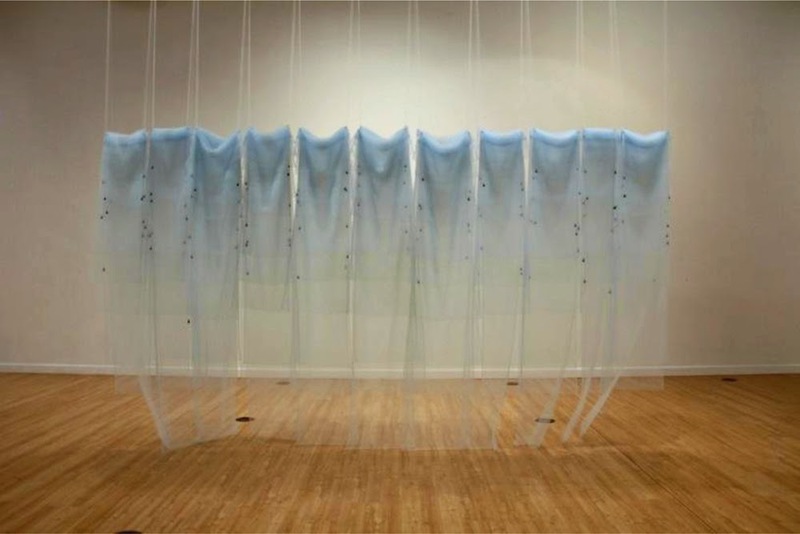 Kristina Estell has a MFA in sculpture from University of Minnesota, Minneapolis. When I worked with her, I was inspired by her investigative use of materials and that her site-specific installations encouraged audience activation (rather than passivity). She is doing exceptionally well as a practicing artist, so I felt any ideas and answers from her would be inspiring for us all. Thanks so much Kristina. Q: Tell us about a project that you are working on now. A: As we speak, I am installing a show in Lincoln, Nebraska where I am part of a two-person exhibition at Darger HQ Gallery. Devised Province will be a mix of some recent sculpture work and the 2D work of Roswitha Weingrill, a great Austrian artist. I am really excited to see how it all comes together and work in the new gallery space of Darger HQ. 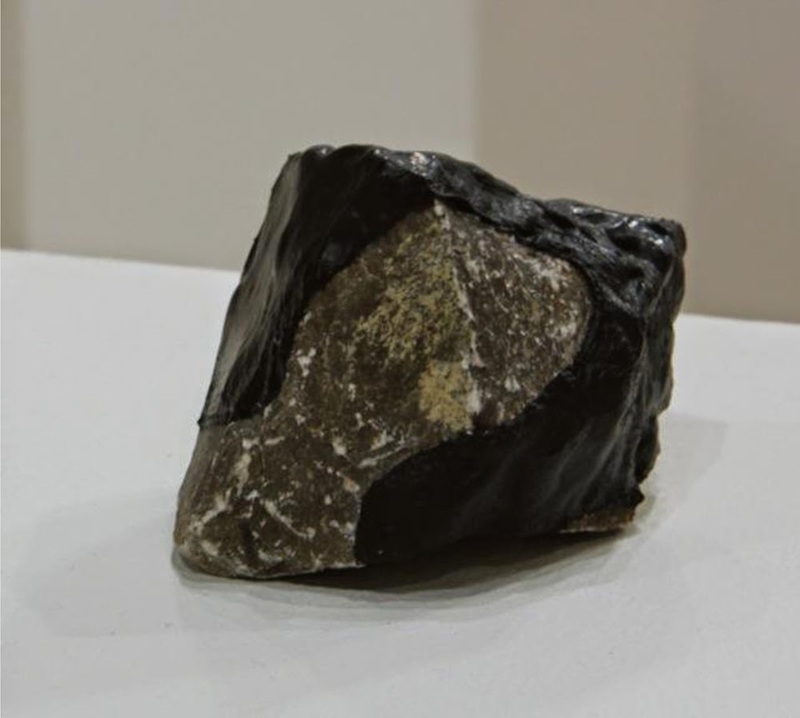 Joining this gallery has been the start of turning my focus back to creating more sculptural work after having a past year of large, intensely laborious installation projects. Q: I think a lot of your work is about experimenting with materials. And, I think it is safe to say you do quite well working both two-dimensionally and three-dimensionally. Can you describe how you decide on certain approaches and materials over others for any given project? A: More and more I think about proximity and accessibility, in practical and conceptual terms. Whatever the subject I am working with, I have to consider how to accentuate or amplify the quality in which I am most interested and how that quality is accessible to the viewer. You are right, I rely on experimentation with materials, colors and textures quite a lot. I feel, though, that the specific materials I use are recognizable and familiar to most of us in some form but because I use materials in an unfamiliar way, I rely on the audience to be able to understand the texture, weight, etc. of various materials to lend to the overall experience of the work. In the two-dimensional bubble wrap works I make, I feel that the fragility and delicacy of the little pieces of plastic needed to be enlarged and made graphic to enable the sense of the material to be something more than a piece of discarded bubble wrap. I feel these paintings, in watercolor especially, enrich the material with a sense of romanticism and require the viewer to look at the plastic removed from its low, transparent reality in an isolated, revealing white space. 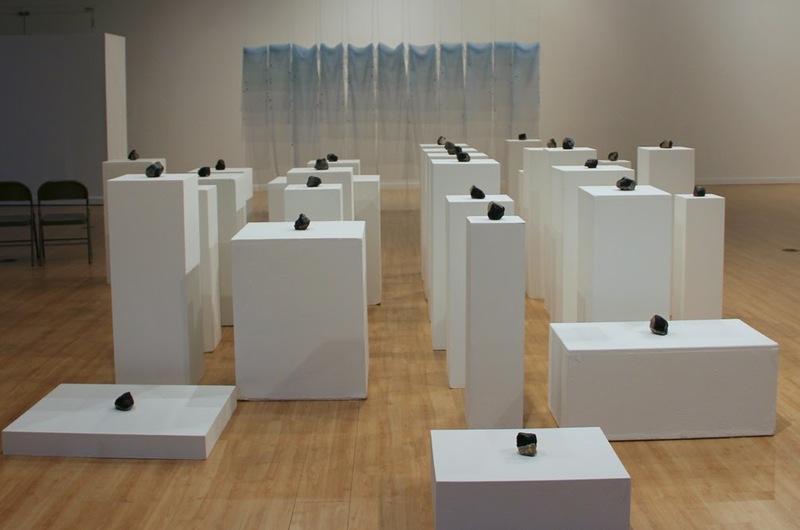 An installation shot of Estell's work in the John A. Day Gallery (minus the chairs from the artist talk). Q: You have done quite well as an exhibiting artist in the upper Midwest. Your work references the local landscape but you show all over the country. Can you give any suggestions for artists looking to show their work in both big cities and at local venues? A: I really don’t discriminate too much between calls for opportunities to exhibit or attend residencies. As long as the program sounds interesting and I feel like it would be somewhat feasible financially and time-wise… I apply. I think it is sometimes easy to talk yourself out of making applications due to doubt of the possibility of being selected or to overly scrutinize the details of it working out…but you never know! Certainly, my pile of rejections is enormous but I try to just set the latest notification aside and move on to what is next. I think it is very important to keep an active resume whether you are approaching urban or local or international venues. Q: Of all the exhibitions you took part in, which are some of your favorites and why? A: A couple shows in 2013 were significant for me in a few ways. Last fall I was honored to be part of the ,,, (comma comma comma) Minnesota biennial at the Soap Factory. It was great to be a part of such a strong and diverse group of MN artists and performers, to be given a lot of freedom to create an installation in the historic Soap Factory gallery and to work with the curators David Petersen and John Marks again. Being selected to exhibit at the Minneapolis Institute of Arts in the Minnesota Artist Exhibition Program was another highlight for sure. This solo exhibition, Posture is Everything, was a materially indulgent project that I had been designing for some time. This exhibition allowed me to create the large-scale (experimental!) installation in a great institution with a dynamic audience and really formed a network of new connections with many Twin Cities artists and art professionals. Q: Any galleries you recommend that are putting together particularly good shows of contemporary art? A: In Minneapolis, I enjoy the programming of a newer gallery to the city, Public Functionary as well as the Soo Visual Art Center. Q: Where do you see yourself by early 2015? Any plans for some new art projects?